On the surface, Saturday's PASS North Super Late Model race at Thompson Speedway (CT) had all of the makings of a great story. A former track champion appeared to bring a long winless streak to an end, a young star with a record of recent success overcame adversity to battle for a victory at his home track and two former series champions were right there at the end too. But Rick Martin was greeted by a chorus of boos when he headed to victory lane and it seemed like the crowd assembled might have wished for Martin to have his win nullified. As it turns out, their wishes came true. On Monday, PASS officials ruled that Martin jumped the final restart. Martin was relegated to second while Ben Rowe was declared the winner. The trouble actually began on lap 73, when Matt Frahm found his car stopped against the backstretch wall. 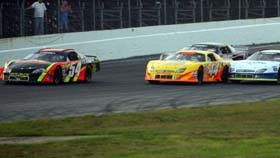 Martin was the leader at the time with young Derek Ramstrom applying heavy pressure. 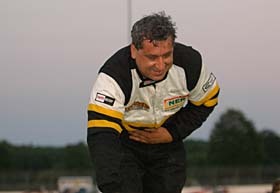 Ramstrom, a PASS North regular who has won the last three weekly Pro Stock races at Thompson in his spare time, had started in the rear of the field after mechanical problems in his heat race. At that point he hoped to be able to make a late race pass for the lead. The caution came out for Frahm's incident and on the restart, Ramstrom made a move on the outside to get into the lead. Instead, he found himself bouncing off the outside wall. How did this happen? We'll get to that later. There's still a more telling story in this one. With Ramstrom out of the picture, Martin appeared to be coasting to an easy victory. But it was anything but easy for Gary Bellefleur further back in the pack. Bellefleur spun in turn one and backed into the outside wall hard. The caution came out as a result. Martin slowed, but Ben Rowe, Trevor Sanborn and Johnny Clark didn't. They all motored right on by and back to the start-finish line. We'll have more on that later as well. Rowe, Sanborn and Clark weren't greeted by a checkered flag. Officials ruled that the white flag hadn't come out, so PASS deemed another attempt at a green-white-checkered finish necessary. PASS officials did try several times to have Rowe moved to the lead, but to no avail. the race, as well as the angry fans - who weren't happy about seeing their favorite son Ramstrom get taken out of a battle for the lead. So just who did win? Well, that was up for debate. Martin did his victory lane interview and Rowe also claimed that he was the winner. Also, was Martin maintaining that “reasonable speed” by backing off? Did Rowe, Sanborn and Clark exceed it by making their passes? 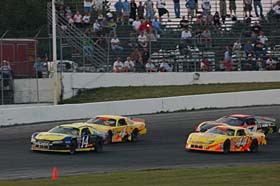 The finish of the 2007 Mason-Dixon Meltdown, a PASS South race at Concord Motorsport Park (NC) created a type of precedence. 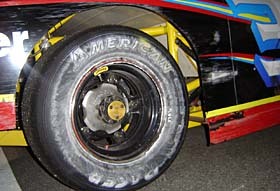 In that race, Corey Williams was headed towards a likely victory when he found a spun car on the frontstretch on the final lap. Williams slowed and Rowe got by him to take the race victory. Another issue was the final restart, when Martin pulled away from Rowe when he anticipated the green… maybe by a little bit too much. A driver behind the battle for the lead had no doubt what Martin had done. “One of the signature procedures of the Pro All Stars Series is great race restarts, side by side, with the flagman always starting the race. This is to provide a professional show for the fans and the competitors. 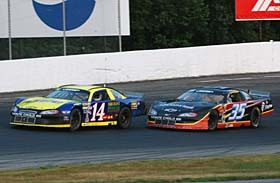 “After reviewing this event it was determined that the 14 car of Rick Martin had numerous borderline restarts. On the final restart at lap 74, with no respect for PASS race procedures or his fellow competitors, he left on his own with a two car length lead. As all the drivers were told in the drivers' meeting, you cannot steal a finish by jumping the restart. We felt his jumping of the restart cost any other driver a chance of winning and cost the fans an exciting, side by side finish. to maintain the integrity of our restart procedures,” concluded Mayberry. though. The Martin vs. Ramstrom incident was on everyone's mind as well. Martin admitted contact blamed Ramstrom for his own demise. “When we came down for the start, he gave me two shots in the door,” said Martin. The drivers behind the incident saw it differently. Ramstrom didn't hide his disappointment after the race. 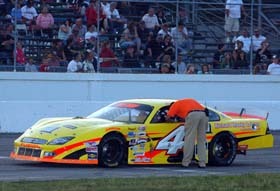 Johnny Clark was credited with third place with Trevor Sanborn finishing in the fourth position. PASS South regular Corey Williams was sitting comfortably in third for much of the race at Thompson. 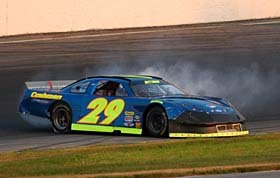 It was the Maine driver's first ride up in PASS North since 2006 and his first time driving for car owner Jay Cushman, but a variety of late race problems left him unofficially finishing back in the 17th position. Williams enjoyed his time working with the Cushman team. After the PASS race was over, Williams wasn't finished with his day. At that point, he shed the tag of racecar driver and went back to his 9-5 job of being a crew member for the NASCAR Camping World East Series team of Andy Santerre Motorsports and driver Peyton Sellers. That series ran their feature right after the PASS race. “I'll go watch the Camping World race and help them load up now,” said Williams. We told you how Derek Ramstrom contended for the victory late in the race at Thompson, but we haven't told you that he almost wasn't even in the starting field. Electrical problems kept the team from running their heat race, so they thrashed to make it into the feature. The team even went as far to take their second racecar, the one raced weekly at Thompson, from the midway of the grandstands to the pits to serve as a back-up if needed. But the team managed to get their primary car ready just in time to race, and it proved to be the right decision. Even the eventual second-place finisher had trouble at Thompson. Rick Martin almost had a tough break with his brakes, but was able to adjust accordingly and still stay out front. pretty well at Thompson too - as proven by a third-place finish. “We finished second here between Cassius once and bumper-to-bumper behind Ben. a fourth or fifth place car, but at least we were in the pack of five that was out front.